Every room in your home needs a great focal point, and the kitchen is no exception. Two opportunities to make a visual statement in your kitchen are the sink and the cooktop. Farmhouse sinks, also known as apron-front sinks, create a dramatic look for both traditional and contemporary kitchens. IKEA’s DOMSJÖ farmhouse sink comes in single bowl and double bowl options. IKEA’s DOMSJÖ farmhouse, or apron front, sink. Likewise, a deep cooktop, also known as a range-front cooktop, has the controls positioned in the front for a commercial, modern look. Strangely, IKEA does not offer an appliance like this. You wouldn’t think a farmhouse sink and a deep cooktop have anything in common, but they do when it comes to this IKEA cabinet hack. How Does an Apron Sink or Rangetop Affect Your IKEA Kitchen Design? IKEA’s sells 36” sink base cabinets that are meant for their DOMSJÖ farmhouse sinks. Typically, farmhouse sinks are about 10” high at the front and the cabinet is made so that the sink sits at about ¾” above the countertop. However, the DOMSJÖ sink from IKEA is only 5” at the front. This means that the SEKTION cabinets that fit the DOMSJÖ sink can’t accommodate non-IKEA apron sinks. They’re too small! When it comes to front-controlled cooktops, it’s even worse: IKEA offers neither the cooktop nor the base cabinet. Why sacrifice the look you want for kitchen? You can use your favorite sink or cooktop without having to resort to an expensive option like a custom-made cabinet. The best option is to customize an IKEA base cabinet to make it work for you. Yes, the same hack works for both appliances. 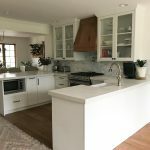 With a few tweaks, these customized or hacked base cabinets are ideal for front-controlled cooktops also because they share the same features and also must sit at about ¾ ”above the countertop. Depending on the type of installation, you can hack either a SEKTION base cabinet or cabinet with doors and a false front to fit underneath either a farmhouse sink or deep cooktop. The most important thing to remember is that the highest part of your base cabinet can only work as a false front, because this space will be used by the front of your apron sink or deep cooktop. Once you have installed the sink bowl or the cooktop, you’ll need to add some separation plus support underneath. Let’s start with the cabinet hack for the cooktop. You’ll notice that just below the cooktop controls, there’s some space that has been covered with a 30” or 36” wide panel (the width will depend on the cooktop you choose). We suggest using leftovers from ⅝” IKEA panels you’ve used to cover the sides of your refrigerator or on the back of a kitchen island. They’re sturdier than the regular cover panels, which are only ½” thick. We used a SEKTION base cabinet with doors, because a gas range top cooktop needs extra space for gas pipes. The doors you’ll have under the cooktop are 20” high. Most cooktops are between 6” or 9” high and they sit flush with the counter, about 1” above the cabinet’s height. In other words, we’ll have a 10”-high space available for our cooktop and panel. For our example, we have used a KitchenAid gas cooktop, the front is 7 ½” high. You’ll need to place the cooktop in such a way that’s about 1” or 1.5” above the cabinet height so it sits flush with your counter. The panel below the cooktop will be about 3” high. Assemble the cabinet frame as indicated in the assembly instructions. After that, drill the hinges to the doors (including the dampers to make you sure you get nice, soft-closing doors) and then attach the doors to your cabinet. Finally, cut your panel and attach it to the door frame above the doors. Some like to reinforce the cabinet from inside and use additional panel strips below the cooktop, across the width of the cabinet. Think of it as building a nice “crib” for the rangetop. It may be a good idea to do this when you purchase a heavier cooktop but it’s not absolutely required. It make take you a bit more than a few hours to do this but as long as you have the tools to cut the panels, it should work. Or if you don’t feel too confident, you can share this information with your installer. The price will still be lower than a custom-made cabinet purchased from a local manufacturer! Instructions state 15″ doors, but purchase list states 20″ doors?? The diagram shows the base cabinet is 30″ wide, but the table says to buy a 36″ wide cabinet. The sink we want to install is 33″ wide (Song Virtuoso), so I think we’d need the 36″ base cabinet, but then we fill the 1.5 inches on each side with??? also, I meant to ask, Ikea sells a drawer front 36″Wx5″H, can you just use that instead of cutting a panel? Can you please suggest a Stainless Steel Apron Front Sink which will fit the 30″ Ikea base cabinet? I plan to get 2×15″ doors and a 5″ door front to go between the sink bottom and the cabinet door. I looked at several 30″ sinks and they call for 33″ minimum cabinet width. I am worried that the sink which I will order will end up not fitting in the base cabinet. The same predicament with the farmhouse sink I bought. Have a 30-inch cabinet but sink requires a 32-inch minimum and no room for a 36-inch cabinet. What did you end up doing? Thanks! I have a farmhouse sink with dimensions 60cm wide x 45cm deep x 26cm high. Do you think this hack would work with this sink? The ikea in australia has a base cabinet called Metod used to fit their Domsjo farmhouse sink. I am unsure if it will work. Thank you. I have the same issue -30″ Cabinet with a 28.5″ interior opening and not enough room for a 36″ cabinet. What if you want to use a 24 inch wide farmhouse sink? I don’t need a 30 inch wide sink, that’s too big. What size Ikea Sektion cabinet would we use?